Once known as ‘Area Shetland’, this sea area was divided into two in 1932 only to be reunited as ‘Area Fair Isle’ in 1949. The journey to the Shetlands from Edinburgh passes over areas Cromarty and Forth on the south east of Scotland. My name is Henrietta and I’m a nervous driver. There. Now you have it. I hang around Sumburg Airport for as long as I can. The keys to the smallest three-door car available are hot in my pocket but I’m ignoring them. I go to the toilet. I flick through the paperbacks on the take-one-leave-one bookstand (other airports, please take note!). I go to the toilet again. I think about following a bloke who looks like a chap off the telly to see if a better glimpse would help me figure out who he is. I visit the toy puffins in the shop, and give a baby one a little squeeze for reassurance. But there’s nothing else for it. I’m either going to bed down in the airport for the rest of the week, or I’m going to go outside the tiny terminal building and bleep-bleep the alarm on my first-ever hire car. And then drive it. I leave the airport terminal – which looks as though it were built from bits left behind from the construction of the Ballycotton Hilton (see previous post) – and walk into an early prototype of a Dyson Airblade. But with rain. Reassuringly, the Mitsubishi Mirage seems to be approximately two Shetland Ponies horsepower. About half a mile down the road I spot flashing lights ahead and join a queue of cars stopped behind a barrier. I wait, wondering what’s going on yet grateful for a break from the mysteries of the Mirage’s windscreen wipers. I know there’s no train service here. Sheep maybe? There are plenty of them. Then the traffic moves forward and as I drive over a suddenly wide and smooth road I realise that the main road bisects the airport landing strip. I’m driving across Sumburgh airfield. While I’m waiting for the ferry to take me from Yell to Unst I tune into the lunchtime Shipping Forecast. Fair Isle: north or north-east five or six. Showers. Good. Occasionally moderate. So nothing much to worry about, I’m glad to hear, wondering was this forecast one of Craig Snell’s. (Should that sentence make you scratch your head, then the earlier post Meeting The Met Office will set you straight). Unst is on the same latitude as Bergen in Norway and Anchorage in Alaska. It is an island of hills and water the colour of slate. It was a Scandinavian society from the 800s until in 1469, Princess Margrethe of Denmark married King James III of Scotland. The Danish king was short on funds for her dowry, so he pawned Orkney and Shetland to the Scots instead. The signposts remind me of the time I got lost in the textiles section of Ikea: Nikkavard, Baliasta, Hjarkland. Robert Louis Stevenson used Unst as the basis for his map in Treasure Island. His father and uncle were well known engineers who designed and built – among others – the Muckle Flugga lighthouse on the most northerly rock of the British Isles. Muckle Flugga is the edge of the edge. My first stop is Norwick beach. This area is an ophiolite; a section of the earth’s crust from beneath the ocean that collided with an ancient continent and was pushed up onto it 420 million years ago. (I think we all know I’m quoting the information board next to the beach here.) It is designated a Site of Special Scientific Interest, a title which manages to be formal and yet cheerfully vague all at once. 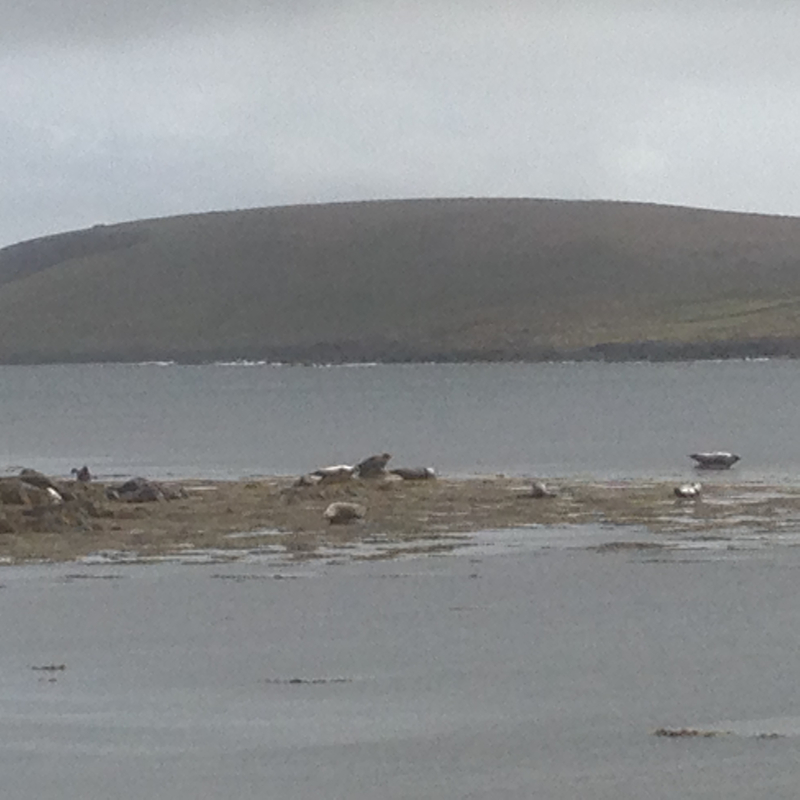 The upshot is that what me and these seals are strolling about on was once at the bottom of the ocean. The RAF Museum at the Saxa Vord Resort comes complete with café, bike-hire and chocolate shop. The large carpark is deserted. The resort appears to have no residents. ‘Where is everyone?’ I ask the man in the apron who runs all of these enterprises. ‘It was very busy earlier,’ he counters. ‘From 11 till 3, it was busy.’ ‘Oh,’ I say. ‘That’s good.’ But I’m thinking really? Until it closed in 2006, Unst was home to the UK’s most northerly RAF station. (Nearly everything on Unst comes billed as ‘most northerly’. Most northerly post office, hotel, bus stop… it’s the island’s USP.) The role of the base was to provide an early warning of air threats to the UK. From the 1960s until the fall of the Berlin Wall, fighters from here practiced bombing and missile runs. In an attempt to encourage staff to Unst, the RAF produced a manual, the first page of which reads: A posting for RAF Saxa Vord may seem to offer at first sight an unattractive prospect. 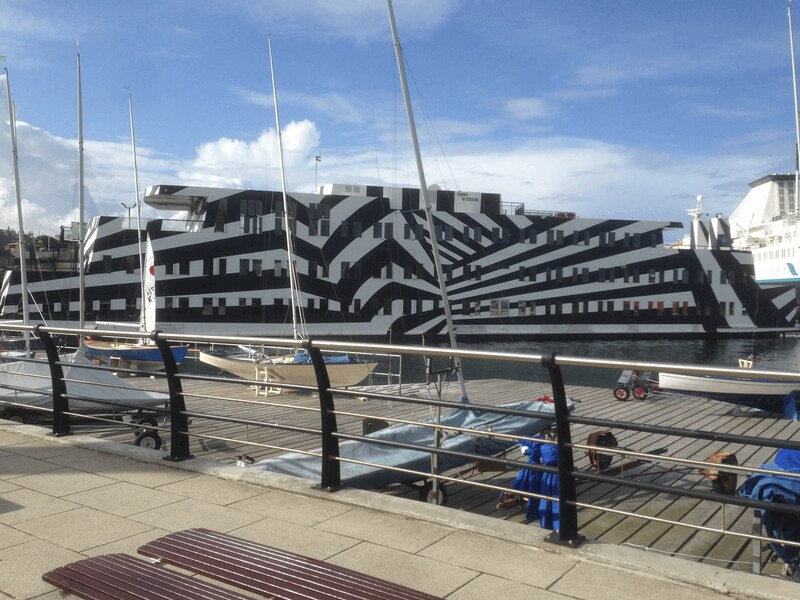 But Shetland has much to offer the person who is willing to make slight adjustments to their way of life. The islands with their sense of history and adventure have great charm …. For example, you will see the New Year Festival of Up-Helly-A when a torchlight procession reaches its grand finale with the burning of a Viking Ship …. The islands abound in legends of trolls and giants. 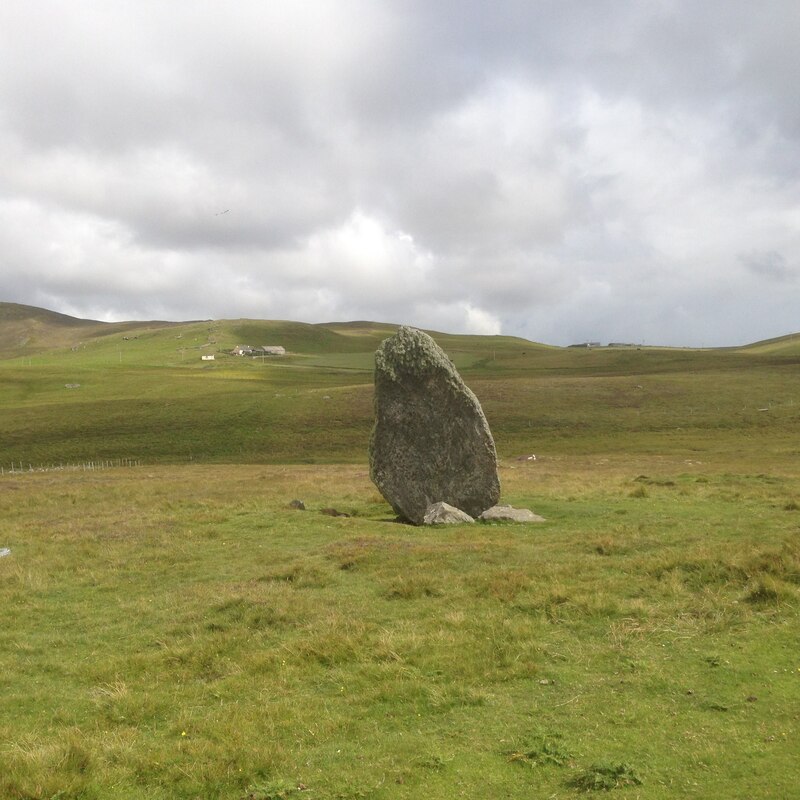 I head off to find the Underhoull and Lund Viking sites (the photograph is the Lund Standing Stone). You can’t throw a puffin in Unst without hitting a Viking site. The island has over thirty Viking longhouse sites alone. 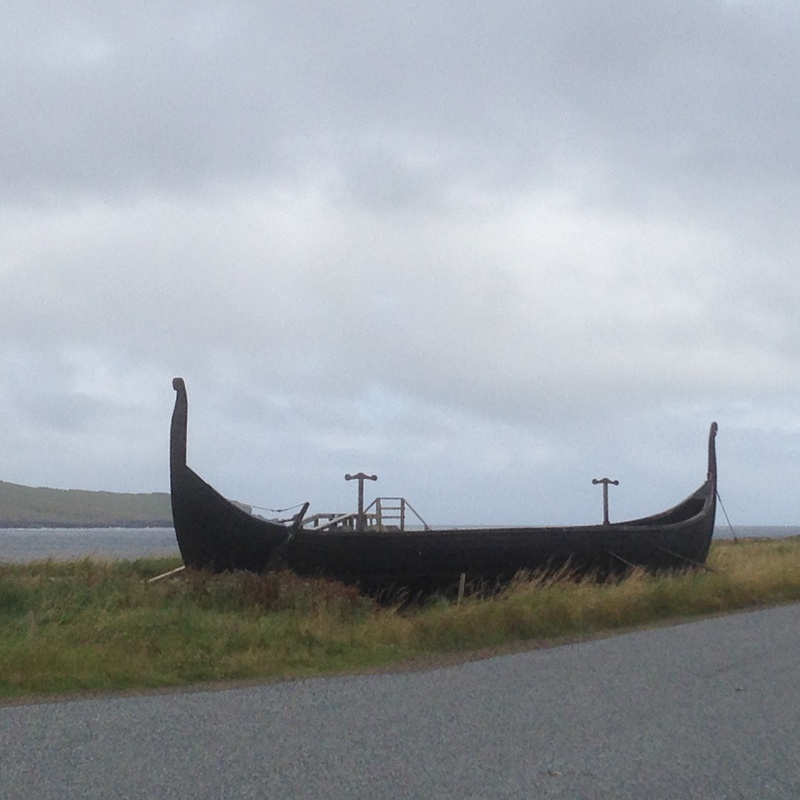 The Viking Unst project reconstructed a longship, and the one pictured here is the Skidbladner, a replica of the Swedish Gokstad ship that became stranded in Shetland during an unsuccessful attempt to sail to the USA in 2000. The girl behind the counter in H Henderson’s grocers tells me that they had 69mm of rain in Unst the previous Saturday. ‘But that’s nothing,’ she adds, ‘they had 128mm over on Fair Isle.’ ‘Hurricane Bertha, I suppose,’ I say knowingly, thinking I’m all about the weather, me. ‘Nah,’ she says. ‘That didn’t come in till later on.’ She’s known days where they’ve had rain, sun, fog and snow one after the other. Both Andy Yeatman and Craig Snell in the Met Office referred to calm or unremarkable conditions as ‘no weather’. This place is the opposite. 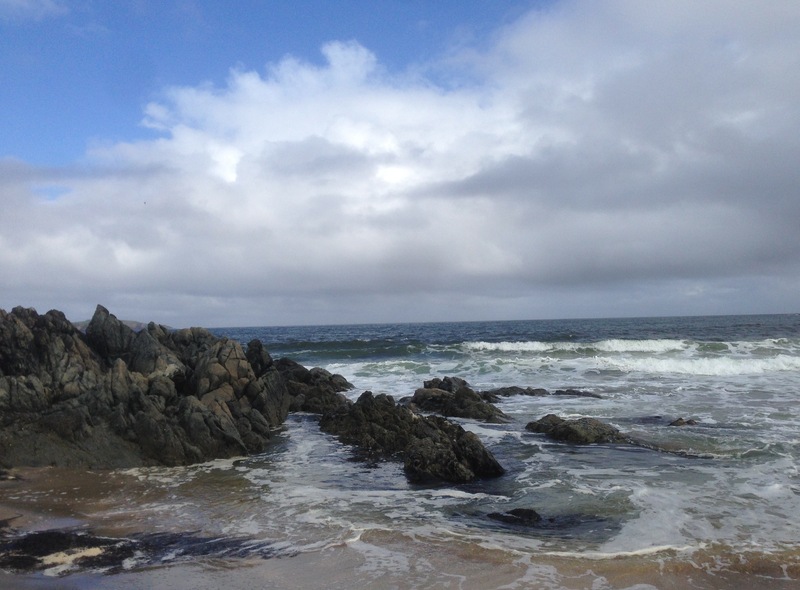 Shetland is all the weather, all the time. In the fantastic Museum of Shetland at Hay’s Dock on Bressay Sound, I read that people have lived on Shetland for about 6,000 years. At Jarlshof there are remains of buildings from stone age to medieval times, and in the 1970s a burial site with the bones of 18 people more than 5,000 years old was discovered at Sumburgh. The display devoted to the North Sea Sullom Voe oil find (‘this black harvest from beneath the sea’), claims that the construction work displaced enough earth to bury all of central London one foot deep. The display features newspaper headlines from The Shetland Times. ‘The Oil Gushes’ gushes the headline of March 1972. Next to it is a cutting from June 1974: ‘First oil spill at Sullom Voe.’ It’s still a huge local employer and two floating hotels (see photo) are moored in Lerwick harbour to accommodate Sullom Voe employees. The sun is shining as I leave the building, but by the time I get my sunglasses out of my bag it’s raining again. The few touristy shops I pop into sell the usual seaside homewares bits and pieces, just as their equivalents did on St Mary’s in the Isles of Scilly. Shells laced onto strings with blue ribbons, limed wood plaques with nautical motifs. But they just don’t make sense here the way they do in Cornwall and Devon. Such sun-drenched tweeness needs a more orderly landscape. When I leave Shetland the water is the colour of gulls’ wings and the sky clears its throat over and over as we cross sea areas Fair Isle, Cromarty and Forth. Back in Edinburgh the hills no longer loom darkly over the town but have retreated to the distance, the painted flats of a stage set. The clouds are high in the sky once more. Back where they frame our days, rather than trying to walk among us. Brigadoon is gone, swallowed up by a silver mist. The General Synopsis At Midnight is my exploration of the sea areas of the BBC R4 Shipping Forecast, thanks to the Maeve Binchy Travel Award. The earlier post ‘Counting Down To Midnight’ explains the project. From the poem Celtic Cross by Scottish poet Norman MacCaig. My reading during this trip was appropriately stormy: Rumours of a Hurricane by Tim Lott. Fantastic H, a fine piece of vicarious travel. Bringing back the island sailing with the folks. I’m looking forward to the rest. Good work, Rob. What an enjoyable piece of writing!